About Tinnitus - Hearing Evaluation Services of Buffalo, Inc.
HES has the only four Audiologists in WNY who hold Tinnitus Practitioners Association credentials. 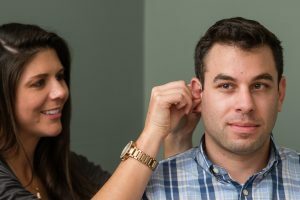 Our research-backed tinnitus management programs fit every patient’s unique experience with tinnitus. Hear our Tinnitus-focused Podcast about solutions for Tinnitus Management, patient stories and more. 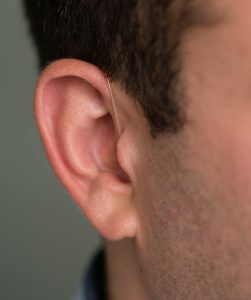 Tinnitus is the perception of sound heard in the ears or head that is not actually present in the environment. The sound associated with tinnitus varies from person to person, however, it is typically described as a ringing, buzzing, hissing or clicking. Tinnitus is often accompanied by oversensitivity to sound, which is clinically known as decreased sound tolerance or hyperacusis. Tinnitus is also strongly affected by your emotional state. Therefore, anxiety, stress, or depression can worsen your tinnitus. Tinnitus can occur as a result of many factors, however it is commonly caused by inner ear hair cell damage, which occurs when the tiny hair cells in the inner ear are overworked and bent or broken. This breakdown of hair cells triggers impulses to your brain, causing you to hear what you perceive as tinnitus. A tinnitus appointment at Hearing Evaluation Services (HES) is conducted by a certified Tinnitus Specialist, certified by the Tinnitus Practitioners Association (TPA), who will administer various, non-invasive tests to help identify the cause of tinnitus and the best way to treat it. In addition, these appointments offer patients an opportunity to discuss how tinnitus affects their lives, physically and emotionally. Gaining insight into an individual’s personal struggle with tinnitus is useful in developing an individualized and effective management plan. Your audiologist will record measurements related to the pitch, loudness, and nature of your tinnitus, which will guide the rehabilitative process. Upon completing the evaluation, the patient can expect to receive educational counseling and treatment options that can help to decrease the patient’s perception of tinnitus over time. Treatments for a condition called hyperacusis, or an abnormally low tolerance for sound, are also offered to help patients overcome their aversions to loud sounds.